A sizable $92,794 was donated to this year's charity, Sit Stay Read! $50,000 of that was donated by the convention itself, and over $12,000 came from the Foxes and Peppers "Spread thy Wings" concert. Next year's FurFest will be from December 5th to 8th, 2019. Here's to the con's continued success, and Congrats to everyone who made it happen! Drawback: How do you fit everyone in one room for the opening and closing ceremonies? Looks like you got downvoted for nothing. Upvoted by principle. Yeah, there's a couple people that just follow me around and do that. It's kinda sad but haters gonna hate. The Hyatt's side ballroom, which takes up the full of the Eastern wing of the hotel was opened up this year and was able to fit all for closing (not everyone goes mind you). They did this by moving the ConSuite to another section that was once used as a secondary performance stage (The "Rosemont"). The secondary performance stage was moved to a large room in the convention center, which was the Artist Alley last year. The Artist Alley was moved to the ground floor and was the same size as the dealer's den. So they had rotated a bunch of stuff around and improved traffic flow. The Hyatt was certainly less crowded than it was in years prior. Given that Anime Central takes places in the same facility and is currently in the 30,000 attendee slot, the facility is capable of handling the larger crowds. But then comes the line issues. Which I'll probably be covering in its own article. 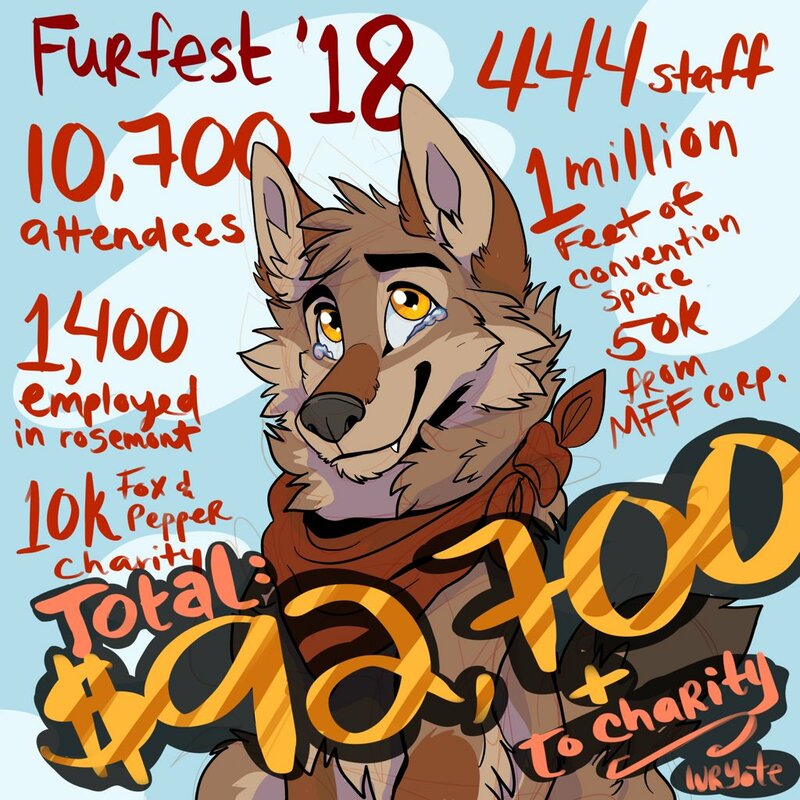 Since then, the convention has grown from 473 attendees into 10,750 in 2018, making it the largest furry convention in the world by more than 2,300 attendees over the previous largest convention, Anthrocon .